Wrapper class for /dev/random and /dev/srandom. Encapsulates /dev/random on Linux, OS X and Unix; and /dev/srandom on the BSDs. On Linux the /dev/random interface is effectively deprecated. According to the Kernel Crypto developers, /dev/urandom or getrandom(2) should be used instead. Also see [RFC PATCH v12 3/4] Linux Random Number Generator on the kernel-crypto mailing list. Definition at line 118 of file osrng.h. 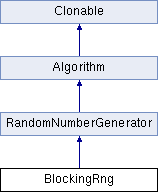 Generate random array of bytes. GenerateIntoBufferedTransformation() calls are routed to GenerateBlock(). Definition at line 209 of file osrng.cpp.